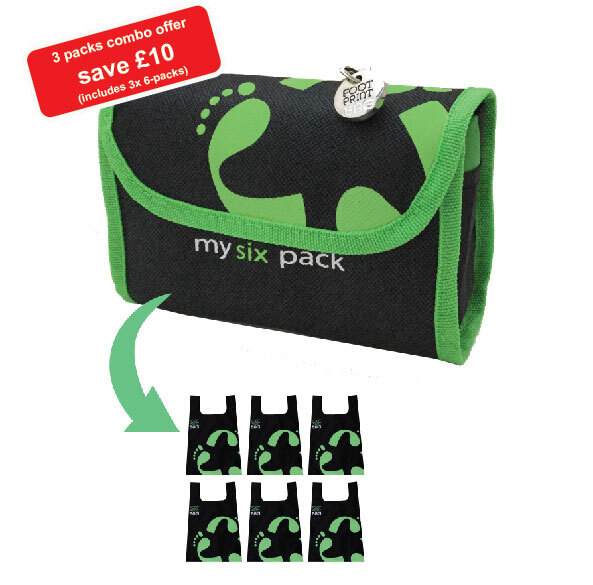 Combo packs save you money when you buy three Footprint Bag packs, and at a great price! They are tough, stylish and lightweight ripstop polyester bags. Each bag opens to the size of a large carrier bag. There is even a handy trolley coin attached for those unexpected trips to the supermarket. Just think you never need to pick-up another plastic carrier bag and you’re guaranteed to look a whole lot more stylish on your shop! We deliver to the UK only and payment can be made via Paypal, Debit or Credit card on our Ebay Shop. Orders are usually dispatched within 1-3 working days. There are no Reviews for the Footprint Bag Combo 3 x 6 Bag Green Packs - SAVE MONEY yet. Why not be the first to write one?